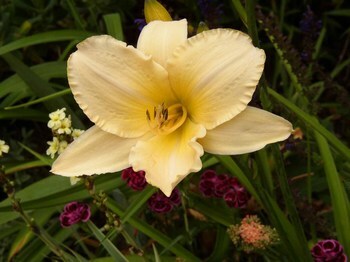 A lovely picture of this Hemerocallis was chosen for the new Conservation Scheme page on the HPS website although it is no longer on the Active List. It was added to the Scheme in 2002 as an RHS AGM plant that was hard to find and remained in the scheme until 2011 when there were more than 4 entries in the Plant Finder. The AGM award was rescinded, probably in the major 2012/2013 review and perhaps as a consequence its popularity has declined with only 2 entries in the 2015 and 2016 editions of the RHS Plant Finder. Hemerocallis ‘Helle Berlinerin’ (‘helle' means ‘bright’ in German) was bred by Tamberg in 1981 and is a tetraploid variety, blooming in mid-season (July), with large melon-cream flowers up to 13cm across having darker yellow throats. The inner petals have slightly ruffled edges. It forms a clump up to 70cm high with narrow strappy leaves and is winter dormant. Clumps can be divided in spring or autumn. A tetraploid variety has 4 sets of identical chromosomes in each cell (most plants are diploid with 2 sets) and tetraploid daylilies tend to have ‘heavier’ flowers and foliage and the flowers are larger. Plants are usually vigorous although some growers in the Conservation Scheme reported plants to be slow to bulk up. It requires good soil, well drained, but with plenty of moisture available in the growing season and performs well in full sun. Slugs and snails are the main problem especially when the new leaves emerge in spring. A few plants were brought to the Plant Exchange this year and I hope to be able to see how it performs next summer.